Welcome to Van Gilder Aviation Photography. This is just a small sample of pictures that I have taken over the years at air shows and airports. Most are from the Southern California area. New sections and features are added regularly. The updates section will always list the latest additions, with the newest being at the top of the list. There are free desktop wallpapers for personal use and free desktop jigsaw puzzles for those days when weather keeps you from the airport. The long awaited print store is now open! Click the banner below to visit. More photos are being added regularly. Let us know if you don't see something in the print store that you would like and we can get it added. All of my air-to-air galleries are now in one section for easier navigation. Here, you will find pictures taken at the airshows that I have attended. This section has pictures with a story. Like an on-line article on a particular subject. Air-to-air photography is in this section. Pictures that are aviation related that don't fit into the other classifications. My sketches are included here. Aircraft taxiing or on static display. Also some older shots taken with my point and shoot digital camera. Use some images from this website for your desktop wallpaper. Photos from this website as Jigsaw Puzzles- FREE! My personal favorite shots of 2006. New section on vintage camera equipment that is the start of our museum. Sometimes I shoot other subjects that are interesting. They are here. Other cool places on the web. A chronological list of changes made to this website, with the newest changes first. Use the search tool below to search this site. 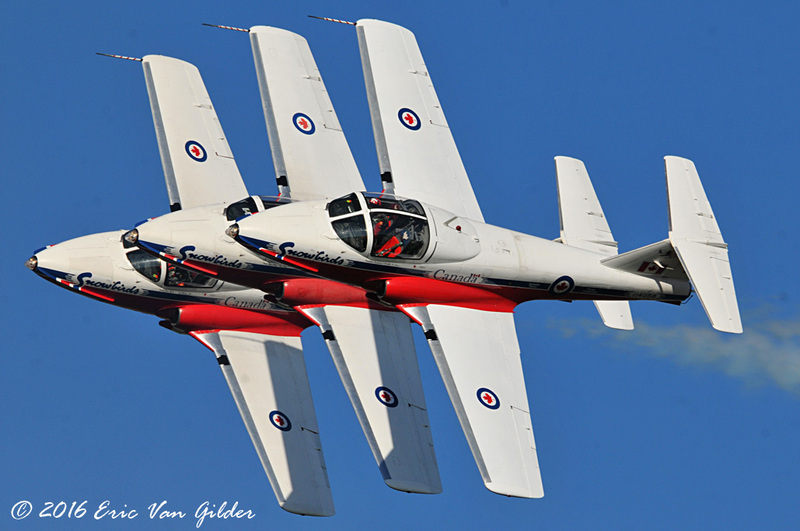 Three of the Canadian Snowbirds display team over Oshkosh. Feel free to drop me a note and tell me what you think of this site and my photos. Please note that these photos are copyrighted and are NOT public domain. Please contact me for rates to use these photos for commercial and/or print use.